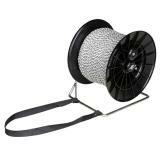 A very popular reel for winding, unwinding and storing conductors. Almost twice the capacity of our original EzeReel™. Pre-winding available—If you would like our conductors pre-wound on an EzeReel XL, please choose from the options shown within the accessories tab below. Old supports will fit new reels. Old reels (purchased before March 2015) may need to be modified to fit new supports: Use a 1/4" drill bit to increase the diameter of the receiving holes to match the larger locking pin. The following items are used, which have been returned to Premier, but in good working condition. All sales are final, no returns. While supplies last. You can hang the EzeReel XL Complete by using brackets (sold separately). Much faster than using the hand/elbow method and will keep rolls neater and untangled. Can be purchased with or without the support hardware. Extends conductor life by allowing it to be stored inside when not in use. 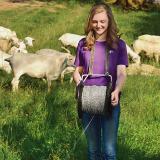 Easier to use than New Zealand-style reels because the reel itself is supported by a strap around the neck instead of a hand. 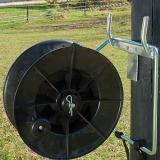 Wind the reel with the right hand and use the left to remove and install posts and/or conductors or to feed tape flat on the reel. 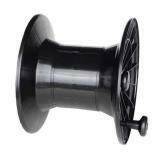 Requires fewer turns to wind up 1000 ft than other reels because it has a large 20" inner-reel circumference. A spring-loaded metal latch locks the reel in place when not in use. The reel itself is supported by a strap around the neck instead of a hand. 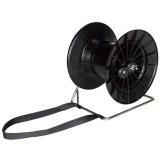 You can wind the reel with one hand while using the other hand to remove or install posts and/or conductors or to feed tape flat on the reel. Tip: To reduce costs, multiple spools can be used on the same metal frame. 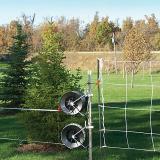 Can also hang the EzeReel XL Complete on either wood post using a wood post bracket or steel post by using T Post bracket (sold separately). Pre-winding available—If you would like our conductors pre-wound on an EzeReel XL, please choose from the options shown on the accessories tab above. Alot smaller than I expected since it was the XL suppose to hold more footage than the standard. I was happy about that and it held all I needed. ONLY problem I had was that trying to hold it on the ground to wind my rope the hole/protrusion where you can switch the handle for right or left hand operation on the spool busted the heck out of my hand trying to steady the reel while winding. Kept repeatedly busting my finger when it came around. Another small handle on the opposite side that would help you hold on to it would be a GREAT improvement. That handle would have to be moveable to the opposite side as well if its offered for right or left handed opearation. There is no other means of anchoring it down (by hand) if not on the chest with the strap. 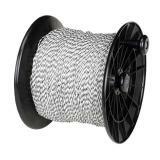 This review is less about the specific product (the EZ Reel spool) than it is about Premier 1 as a company. I LOVE doing business with Premier 1. Excellent prices, great products, super quick turnaround, and you can actually speak to a REAL PERSON when you call them! We bought these to use with IntelliRope 4.5. This website said that only 1000 ft of intellirope 4.5 fits on this reel. I didn't have any problem putting a 1320 ft roll in myself. I have used these for a few years. They work pretty well. It helps to use duct tape to keep the first wrap around the spool from sliding. 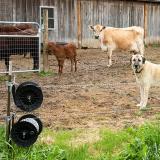 We've used these for years for cattle and sheep. After a couple of years of hard use in our wet climate the rivets that hold the straps in place rust out. Simply fix by sewing or riveting back in place. Great product.